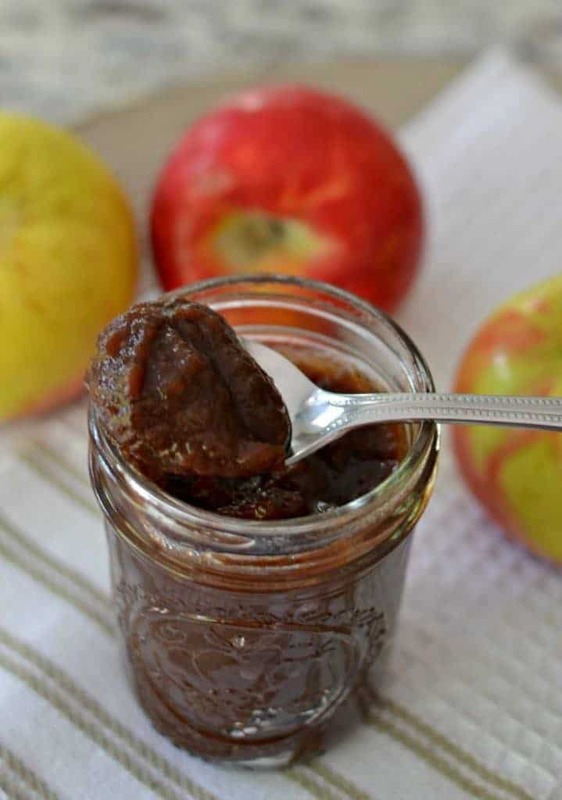 Homemade Apple Butter is a scrumptious fall tradition that goes back many generations. This easy crock pot recipe will bring back fond memories of the butter your grandmother used to make. 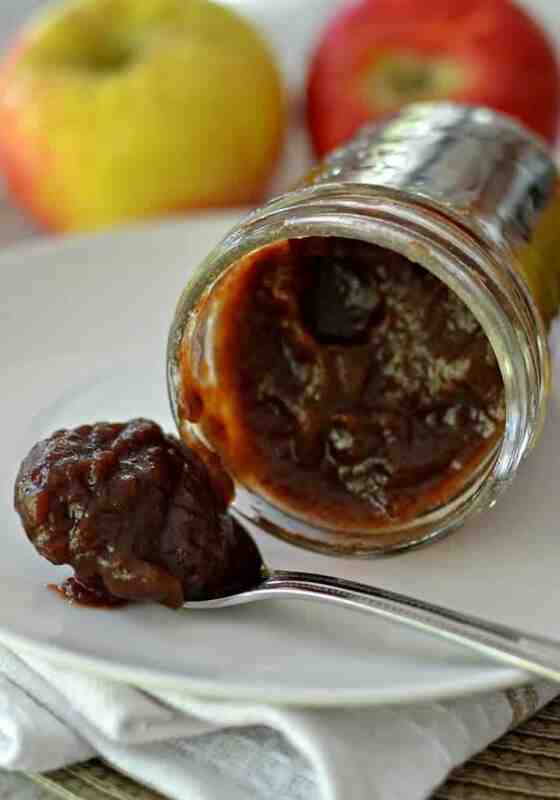 We call this Sunday Apple Butter! You put it in the crock pot at the crack of dawn, cooks all day making the house smell like heaven and come supper time you have the most amazing goody. Fall is approaching fast and fresh crisp apples are in at the market. What better way to celebrate the season that with a crock full of apples, cinnamon, cloves and nutmeg. This is a small batch recipe that makes about two pints so if you want to do some canning I would double or triple the recipe. The first step is to peel, core and slice the apples. Then toss them with sugar, cinnamon, ground cloves, nutmeg and salt. Slow cook on low for at least ten hours then remove the lid and set ajar so steam can escape and continue cooking until the mixture is dark and thick. Spoon into jars and store in fridge for up to several weeks and if frozen up to several months. As always check for spoilage, mold, strange odors or colors. Gala, Fuji, Red Delicious, McIntosh or Jonagold are good meaty apples that make awesome butter. Although Honey Crisp and Granny Smiths are great for baking they are not ideal for this as you want softer apples for this jam. You can adjust the amount of sugar to the sweetness of the apples. 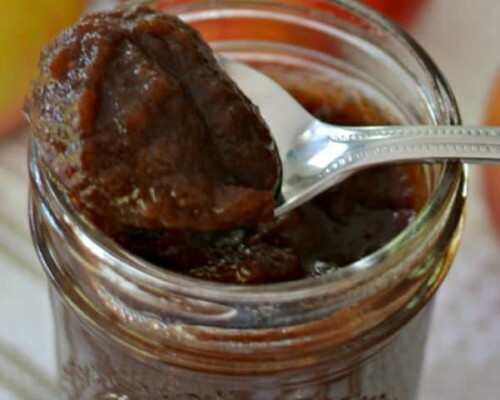 Is there really butter in Apple Butter? This may come as a shock but there is not any butter or anything that resembles butter in apple butter. Hence the name butter came from the smooth texture of the apple spread over toasted bread and warm biscuits. You will see exactly what I mean after you make your own batch! Certainly this amazing jam will become a family tradition in your home and consequently bring the scrumptious taste of sweet fall apples and cinnamon to your table. Other Apple Recipes you will love! 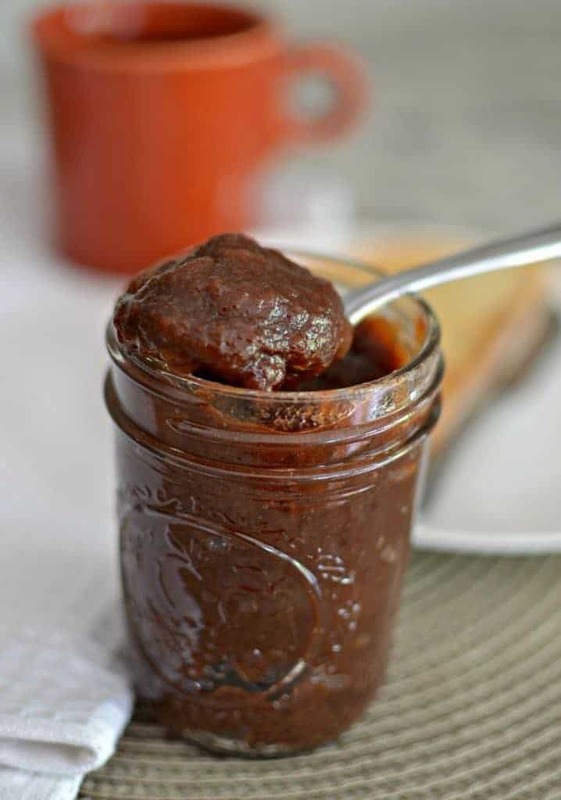 Homemade Apple Butter is a scrumptious fall tradition. This easy crock pot recipe will bring back fond memories of the butter your grandmother used to make. In large bowl combine apples, sugar, brown sugar, cinnamon, ground cloves nutmeg and salt. Stir gently but well to combine. Place in slow cooker and cook until mixture is thickened and dark brown: approximately 10 hours. Set the lid slightly off so the steam escapes and cook down to desired thickness. Using an immersion blender puree the apple butter until smooth. A blender can be used as well but cool the mixture first and make sure you remove the cap on the blender so that steam escapes.